Cognitive Hypnotherapy, is a modern approach, which aims to effect change on an unconscious level in the shortest possible time. The aim is to effect powerful change whilst empowering you with the tools to take back control of your feelings and behaviours. We will work together, with me as your guide, in a relaxed, non-judgemental environment. If appropriate, you will receive relevant hypnosis mp3s to listen to at home. You will learn tools, techniques and strategies to use for yourself. Email and telephone support between sessions, during office hours, if required. Cognitive Hynotherapy Sessions are £80 (Ealing), £125 (London W1) for an hour, longer session are available if agreed in advance.
" Jo creates tailored sessions that are adapted for you with a combination of face-to-face sessions, practical exercises & downloads to listen to at home. The treatment has been of great value to me." During our sessions, you will feel relaxed but will be able to talk to me throughout, so that we can work together to achieve the results that you desire. This usually involves being in a light trance, similar to when you find yourself day dreaming or on autopilot during the day. You can not be made to say or do anything that goes against your values, nor do you have to divulge any information about yourself if you are not happy to do so. There are no fixed ways of working and we are trained to use a mix of proven techniques including Traditional Hypnosis, NLP, Time Line Reprocessing, Positive Psychology, and/or Cognitive Behavioural Therapy. There are no swinging watches in sight! The rate of development is entirely dependent on the individual client. So it is often difficult to predict the amount of sessions you will need. However, I usually see clients for somewhere between two and six sessions, ensuring we work in a way that suits you. I will not be "doing" this to you - you will remain in control and I’m there merely as your facilitator and guide. Constantly worrying? Suffer panic attacks? Stressed? Need more self confidence? Suffer Stage fright? Public speaking. Feel calm, less stressed and back in control of your journey. Sleep apnea, snoring, sleep talking? Need to relax at night? Manage your anxiety, emotions and reduce your symptoms. Spiders, exams, needles, claustraphobia, flying, driving .. Tried diets, lost weight, put it back on? Can’t stop eating? This is just a small sample of problems Cognitive Hypnotherapy could help you with. If I’ve not mentioned your issue, still contact me. If I haven’t got the expertise, I will probably know someone who has. Studies suggest that approximately 90% of our behaviour is unconscious. Imagine what it would be like if we had to consciously make a decision about every behaviour we did - we would never get anything done! We are all motivated to move towards things such as people, activities or behaviour, which our unconscious believes will bring us benefit. On the basis of past experience we avoid things which we our personal belief system believes will bring us harm. For example, if you find yourself avoiding making a presentation, or hiding from spiders, then it’s probably because your unconscious has decided, at some point in the past, that these are a threat. Cognitive Hypnotherapy aims to update our negative beliefs whether they are about ourselves, others or the the world around us, so they can be shaped into something more positive and supportive. So you can begin to feel in control of your life again. Traditional hypnotherapy is often a one size fits-all approach, sometimes just using hypnosis, and heavily dependent on set scripts. However we all experience life in different ways and our problems are unique. Cognitive Hypnotherapy, treats the individual and not the label which has been given to the problem. So I will completely tailor the treatment plan for you using whatever techniques are right for you. I also provide mp3 recordings, for my clients to listen to at home. I find this helps to embed the suggestions, about how you would like to be, and also gives you some material to listen to in the future if an unexpected event causes some of the feelings to resurface. 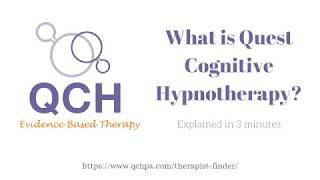 To find out more watch this short animation to help you understand what Cognitive Hypnotherapy is all about.
" I have now achieved things I never thought I would. Thanks to your knowledge and professional approach I now understand the link between what’s been happening in my life." I offer a free initial telephone consultation for you to ask any questions and to see if we can work together. So, whether you would like to overcome a habit, take control of a difficult area of your life or feel happier, contact me and start to make some positive changes to your life. Cognitive Hypnotherapy clinic in Ealing, West London & London W1. "Jo put me at ease from the start. I felt very cared for and given the space to make connections and valuable insights."